The researchers made fibrous fibronectin using a fiber manufacturing platform called Rotary Jet-Spinning (RJS), developed by Parker’s Disease Biophysics Group. RJS works likes a cotton candy machine — a liquid polymer solution, in this case, globular fibronectin dissolved in a solvent, is loaded into a reservoir and pushed out through a tiny opening by centrifugal force as the device spins. As the solution leaves the reservoir, the solvent evaporates and the polymers solidify. The centrifugal force unfolds the globular protein into small, thin fibers. These fibers — less than one micrometer in diameter — can be collected to form a large-scale wound dressing or bandage. The Rotary Jet-Spinning manufacturing system was developed specifically for therapeutics for the wounds of war. 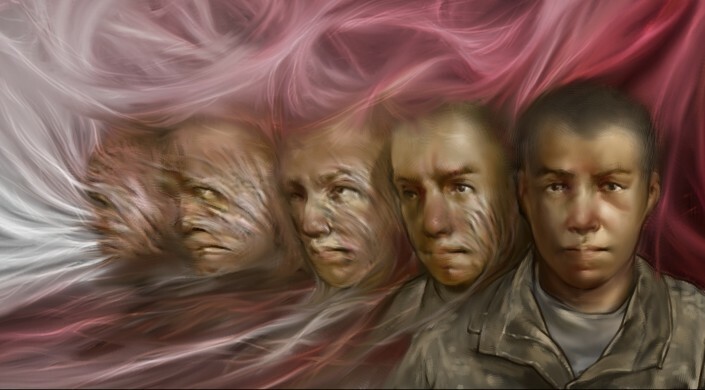 Researchers developed wound dressings that could be a good option for large-scale usage, such as on burns, as well as dressings for smaller wounds on the face and hands, where the prevention of scarring is important. Tissue section 14 days post-wounding reveals the presence of hair follicles regenerating at the center of the wound. Re-growing hair follicles is one of the biggest challenges in the field of wound healing.